Octinoxate, also called Octyl methoxycinnamate or (OMC), is a UV filter. It can be absorbed rapidly through skin. Octinoxate has been detected in human urine, blood and breast milk, which indicates that humans are systemically exposed to this compound ,. Octinoxate is an endocrine disruptor that mimics estrogen and can disrupt thyroid function. WHAT IS OCTINOXATE? Octinoxate filters UV‐B rays from the sun. It does not protect against UV-A rays. Octinoxate dissolves in oil, which makes it a fat-seeking substance in the body. It is formed by combining methoxycinnamic acid and 2-ethylhexanol- compounds which are not harmful on their own. When mixed together, they form a clear liquid that does not dissolve in water. It is found in hair color products and shampoos, sunscreen, lipstick, nail polish, and skin creams . In products other than sunscreens, it is used as a UV filter to protect the products from degrading when exposed to the sun. Endocrine disruption: Octinoxate increases cell proliferation in cells that grow in response to estrogen exposure ,,. Lifetime estrogen exposure is an established risk factor in the development and progression of breast cancer. Octinoxate affects other hormone systems as well. For instance, it reduces thyroid hormones in blood serum . Thyroid hormones are critical for metabolic functions in the body including mammary gland development. Octinoxate exposure has also been found to alter the reproductive systems of female offspring, with significantly lowered hormone (estradiol and progesterone) levels , which is associated with infertility and miscarriages. In males there is a reduction of sperm count at all dose levels . Reproductive organs and development toxicity: Numerous studies have reported that octinoxate exhibits antiandrogenic activity, which is linked to harmful effects on reproductive organ development in male and female fetuses exposed in utero. These effects can be further passed onto their offspring. Moreover, octinoxate alters weight and structure of reproductive organs in male and female rats . HOW TO AVOID: Despite the numerous studies and concerns about octinoxate toxicity and the effect on human body systems, octinoxate is approved worldwide . 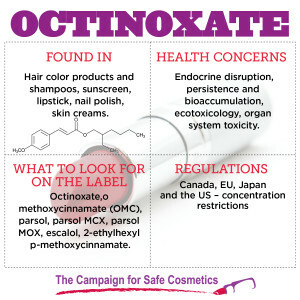 In the United States, it is required to be listed on labels as an active ingredient. To avoid the product in sunscreen, read the list of active ingredients and skip products that rely on octinoxate. 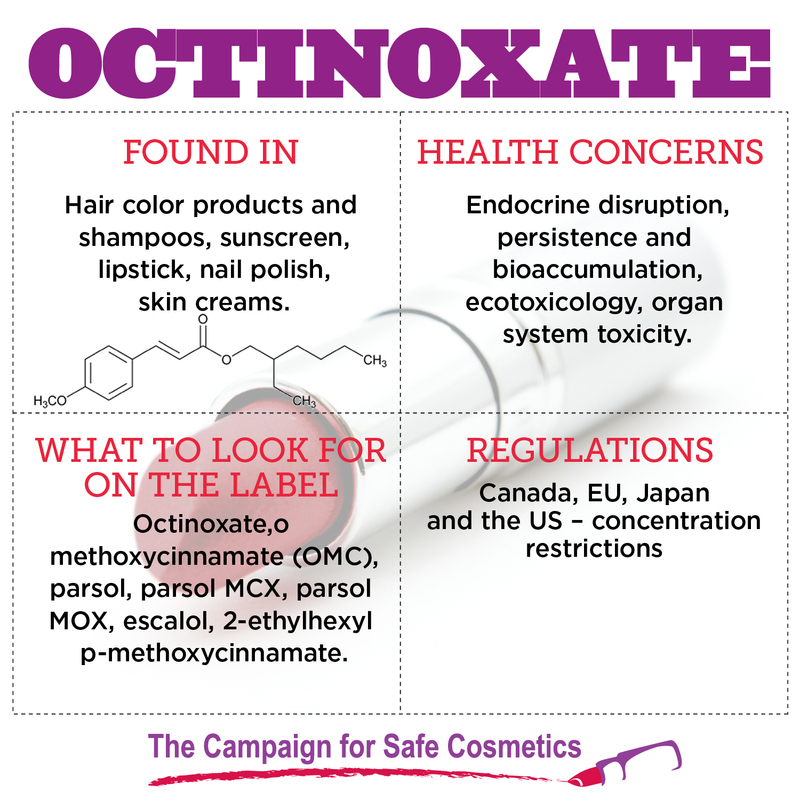 Check labels on hair care products, lipsticks nail polish and skin creams, and choose products that do not contain octinoxate or octyl methoxycinnamate (OMC). Axelstad, M., Boberg, J., Hougaard, K. S., Christiansen, S., Jacobsen, P. R., Mandrup, K. R., … & Hass, U. (2011). Effects of pre-and postnatal exposure to the UV-filter Octyl Methoxycinnamate (OMC) on the reproductive, auditory and neurological development of rat offspring. Toxicology and applied pharmacology, 250(3), 278-290. Darbre, P. D. (2006). Environmental oestrogens, cosmetics and breast cancer. Best practice & research clinical endocrinology & metabolism, 20(1), 121-143. Octinoxate, “Octyl methoxycinnamate- OMCX” [Online]. Available:http://www.kyowa.eu/files/pdfs/Octyl_Methoxycinnamate_(OMCX).pdf. [Accessed 1 October 2013]  U.S Food and Drug Administration, “Principal display panel of all sunscreen drug products” [Online]. Available:http://www.accessdata.fda.gov/scripts/cdrh/cfdocs/cfcfr/CFRSearch.cfm?fr=352.50[Accessed 1 October 2013]  Chemical Information, “Octyl methoxycinnamate”. National Library of Medicine Household Products database [Online]. Available: http://householdproducts.nlm.nih.gov/cgi-bin/household/brands?tbl=chem&id=628&query=octyl+methoxycinnamate+&searchas=TblChemicals. [Accessed 1 October 2013]  Schlumpf, M., Cotton, B., Conscience, M., Haller, V., Steinmann, B., & Lichtensteiger, W. (2001). In vitro and in vivo estrogenicity of UV screens. Environmental health perspectives,109(3), 239. Schlumpf, M., Schmid, P., Durrer, S., Conscience, M., Maerkel, K., Henseler, M., … & Lichtensteiger, W. (2004). Endocrine activity and developmental toxicity of cosmetic UV filters—an update. Toxicology, 205(1), 113-122. Krause, M., Klit, A., Blomberg Jensen, M., Søeborg, T., Frederiksen, H., Schlumpf, M., … & Drzewiecki, K. T. (2012). Sunscreens: are they beneficial for health? An overview of endocrine disrupting properties of UV‐filters. International journal of andrology, 35(3), 424-436.